We know. You haven’t even bought your Thanksgiving turkey yet. But Black Friday starts even earlier this year (one giant retailer will open its doors at 6 p.m. on Thursday evening) and that means only one thing: the holidays are here for real. Which brings us to our annual Barbecue! 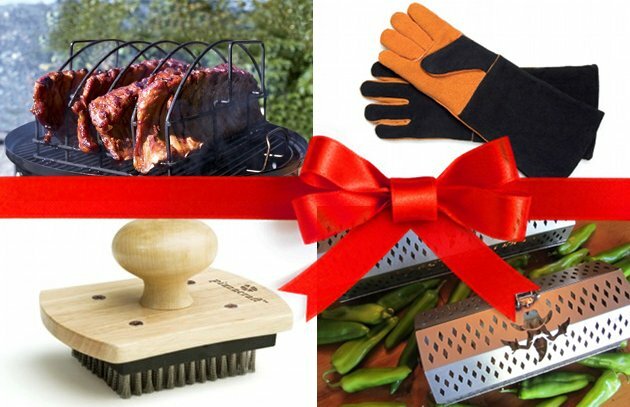 Bible gift guide—a compilation of cool fuels, tools, and seasonings for the favorite barbecuer or griller in your life. Permission granted to print it out and distribute it to people who might need gift ideas for you. 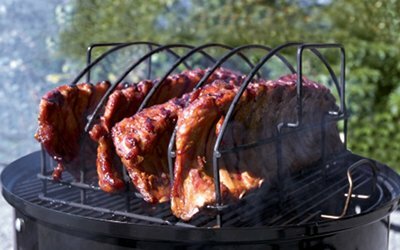 Rib Rack: Full racks of baby backs or spare ribs can take up a lot of real estate on your grill grate. Enter the Best of Barbecue Rib Rack—think of it as a condo for ribs. Barbecue up to four racks at a time in the same space it normally takes for one or two. Other benefits? When roasted vertically, the ribs are self-basting, making them tender and succulent. Plus, you melt out excess fat. $18.99. 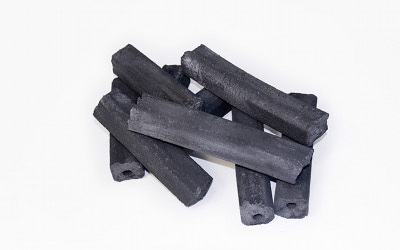 Bincho-tan Charcoal: Naughty or nice, any griller who knows his fuels will be wowed by this exclusive Japanese charcoal. Slow-burning and nearly smoke-free, bincho-tan is the charcoal of choice of Japanese yakitori masters, and can easily achieve temperatures in excess of 800 degrees. Yeah, it’s expensive—I have a chunk on my desk that cost $4—for 1 piece! That makes the $52 for 22.5 pounds offered by Korin seem like a bargain. Grill Gloves: How can you protect your hands and arms from the grill’s heat and still look manly? (Sorry, oven mitts don’t cut it.) 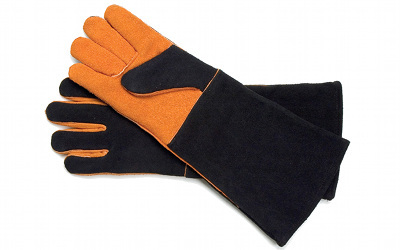 Answer: Heavy-duty suede grill gloves from the Best of Barbecue line. Long enough to protect not just your hands, but your forearms. $18.99. iGrill: One of my barbecue Ten Commandments is, “Never desert your post.” Wise advice when you’re quickly grilling bread, chicken breasts, burgers, etc. But not practical for large hunks of meat that require hours. 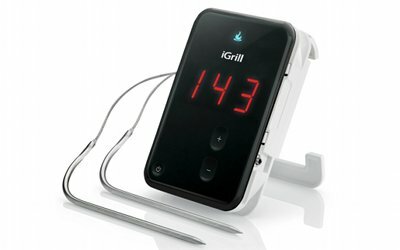 Enter the iPad, iPhone, and iPod compatible, Bluetooth-enabled iGrill dual thermometer and app. Responsive within a 200-foot radius. $79.99. PizzaQue Grilling Stone: Emulate the floor of a wood-fired oven on a gas or charcoal grill. 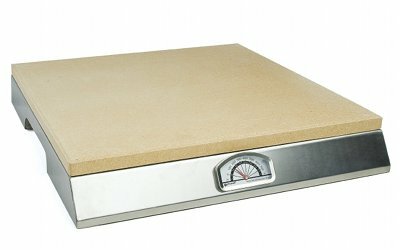 This 15-inch stone is unique in that it has a stainless steel base with a built-in thermometer. Great for crusty artisanal breads and rolls, too. $74.99. 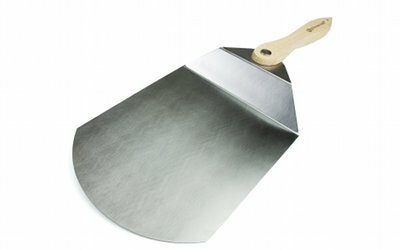 Pizza Peel: Look like a professional when moving your pizza to or from the grill. 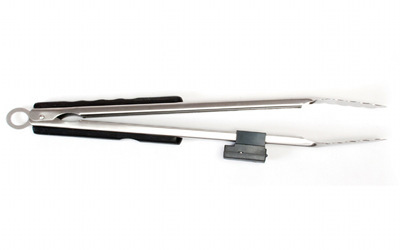 Stainless steel with a space-saving folding wooden handle. $19.39. 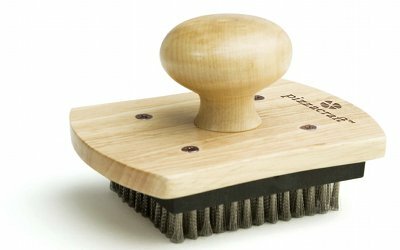 Pizza Stone Scrubber Brush: Stainless steel bristles wedded to an ergonomic hardwood handle keep pizza stones pristine. $9.22. Silicone Dough Rolling Mat: Roll pizza dough or piecrust to precise dimensions on this flexible easy-release silicone mat. $27.59. Lumatong: The darkest days of the year fall in December, but that’s no excuse not to see what you’re doing on the grill. Let there be light in the form of the perennially popular Lumatong, a sturdy, multi-tasking set of locking tongs with a halogen-bulb flashlight mounted on one side. (Yes, the light detaches, making the tongs dishwasher safe.) An illuminating idea. $18.04. Pit Barrel Cooker: Always on the prowl for innovative new grills to add to our collection at Barbecue University, we were delighted to hear from Iraqi war vet and entrepreneur Noah Glanville of Strasburg, Colorado—creator of the Pit Barrel Cooker. 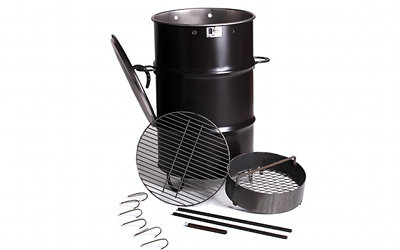 Noah starts with a powder-coated 30-gallon drum outfitted with a heavy gauge charcoal basket, grill grate, two steel hanging rods with hooks (an homage to traditional smoke-houses where meat hangs from hooks for maximum smoke exposure). A whimsical touch: Diamond-brand horseshoes serve as handles and stand. Made in America, and well priced, too: $269 including FedEx ground shipping to the lower 48 states. Planet Barbecue Gift Set with Book: Like a ticket for an epic voyage, a copy of the New York Times best-seller Planet Barbecue (309 recipes from 60 countries) accompanied by nine internationally-inspired rubs and sauces is an introduction to the best recipes and techniques of the world’s grilling cultures. In other words, a global game-changer. $98.00. Make this the year you tour Planet Barbecue. Roast ’Em Up Chile Roaster: Patrick Driscoll placed his annual order for 25 pounds of New Mexican Hatch chiles, then realized he didn’t have an efficient way to roast them. 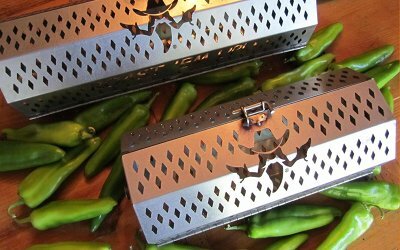 Using materials mostly purchased from a local hardware store, the do-it-yourselfer from Arizona fabricated an octagonal chile roaster that fits on most rotisserie spits. It was a hit at Barbecue University this past June, inspiring us to whip up an addictive batch of chili verde. Available in several sizes, prices start at $139.50. Barbecue University: The ultimate gift for anyone who loves to cook barbecue, eat barbecue, or wants to take his/her grilling and smoking skills to the next level. This intense hands-on 3-day class, taught by yours truly and hosted by the luxurious Forbes 5-Star Broadmoor resort in Colorado, attracts people from all over the world—fitting, as this year’s theme is “Adventures on Planet Barbecue”. A global menu will be prepared daily on BBQ U’s stunning collection of grills representing the world’s most passionate grilling cultures. Food, fun, and fire make for an unforgettable experience. (I was going to say “once-in-a-lifetime”, but remembered how many students return year after year.) But hurry. Spaces sell out fast. Packages start at $2100. Book your reservation soon. Win some of the items on this list by entering our Barbecue! Bible Best BBQ Photo Contest. 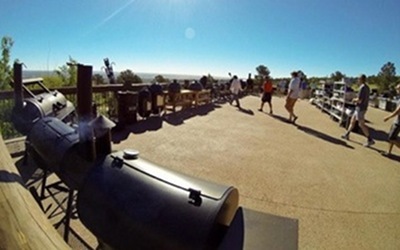 Like our page on Facebook and post your best barbecue photo on our timeline through Dec. 10th. 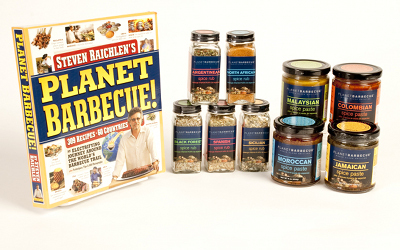 The grand prize winner will get a Planet Barbecue gift set with five spice rubs, three spice pastes, Lumatongs, Ultimate Suede Grilling Gloves, and of course, a copy of Steven’s Planet Barbecue!.